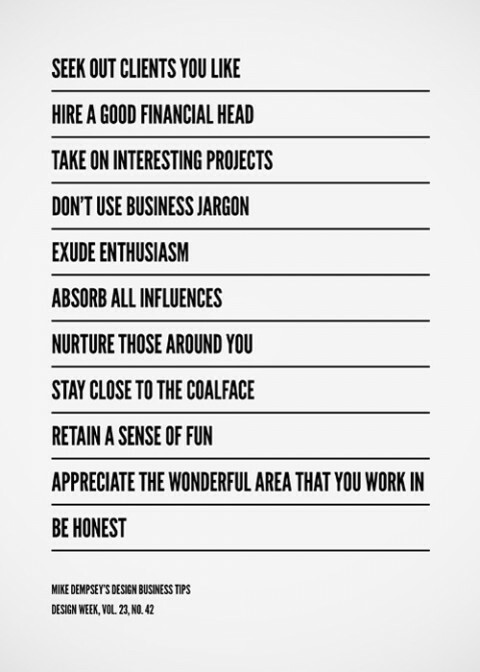 Mike Dempsey’s Design Business Tips. Sometimes you don’t need to have a wide of explanations about it, but by just reading this, you will know what does it want to tell you about your business. As I read it there are things that I do not know before, but right now I will look forward to do it. Very nice tips. Thanks for the link, Miss! every line is perfect. Love it, so glad you posted that, thanks. love it. but what’s coalface? Love this. There’s a real sense of being joyful and thankful in these. Thanks for sharing. And keep one eye toward the horizon.